George (voiced by Kevin Hart) is best friends with Harold (voiced by Thomas Middleditch). The boys are next door neighbors and elementary school classmates. In kindergarten, when the teacher said “Uranus” the boys both laughed out loud and a friendship was born. 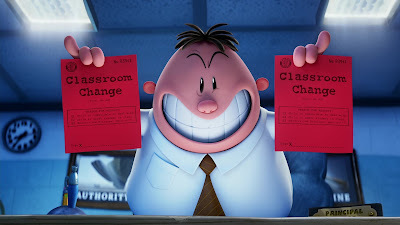 Their pranks make school tolerable but principal Mr. Krupp (voiced by Ed Helms) is not laughing. One of their favorite pastimes is creating comic books. George writes the stories and Harold creates the artwork. But one bad day, Mr. Krupp tears their latest work to shreds. He is fed up with the boys’ antics and decides to put them in separate classes to end their friendship and his problems dealing with them. With their friendship in jeopardy, the boys hypnotize Mr. Krupp, making him believe he is the comic character Captain Underpants. While under their spell, Krupp tears off his pants and leaps from building to building like a superhero. A new science teacher Mr. Poopypants (voices by Nick Kroll) has recently been hired at school. Poopypants hopes to wipe out humor everywhere in the world and someone must stop him. The humor in Captain Underpants is absolutely juvenile. Its is perfect for my nine year old son and the crowd he hangs with. With fart jokes and silly names, it will also appeal to the adult that retained his elementary school sense of humor. It appeals to every kid that ever wanted to get even with their mean principal or even the ones that are just sure that kids are smarter than adults. The characters are adorable but I personally had a hard time with the humor. This is the kind of film that my son will watch again and I’ll make sure to play while I’m busy cooking dinner. I enjoyed the film overall, I just don’t want to keep watching this one. Let’s face it, when you have a child in the house you never watch a movie only once. 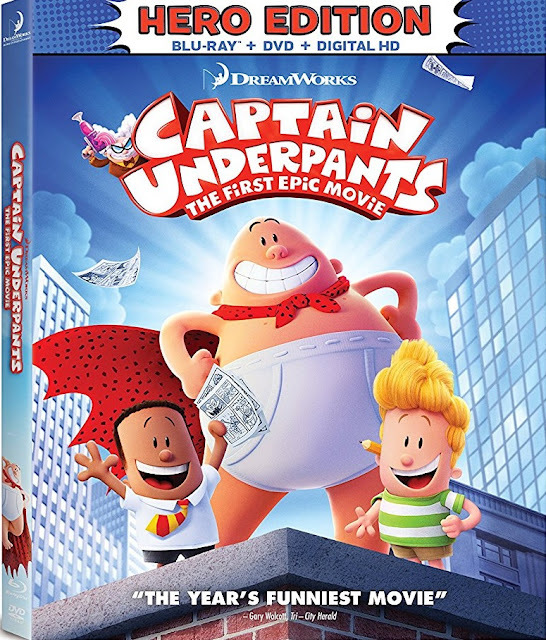 Captain Underpants is bright, colorful and fun on blu-ray. The computer generated animation offers pristine clarity. Colors pop off the screen. The filmmakers added many realistic details and texture to sell the visual presentation and it works. It is easy to forget that these characters aren’t real, and it is also easy to feel for them when they are in peril. The DTS-HD Master Audio 7.1 track is a perfect complement to the video presentation. Action and the softest dialogue are both full bodied and authentic. The bass really comes through in the music and the effects are appropriately positioned. The Really Cool Adventures of Captain Underpants Motion Comic (2:52) – George and Harold read a really cool, and humorously rude comic. 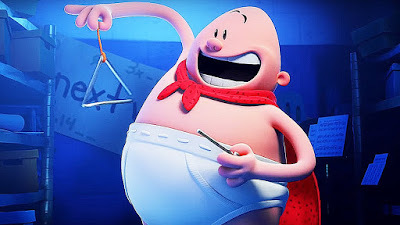 The Captain Underpants Guide to Being A Hero (3:51) – A look at the elements of a superhero. The Professor Poopypants (Totally Original and Supercool) Guide to Being a Villain (3:53) – Learn what it takes to be good at being bad. Missing Underpants: The Deleted Scenes of Captain Underpants (11:00) – The Director introduces unfinished scenes. 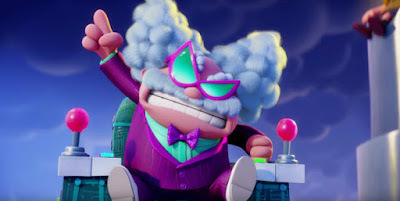 Captain Underpants Lyric Video by Weird Al Yankovic (2:15) – Selected lyrics appear onscreen during this video. “A Friend Like You” Lyric Video by Andy Grammar (3:45) – This video contains complete lyrics onscreen. Tighty-Whitey Q & A With the Stars Part 1 (1:02) and Part 2 (1:02) – Brief answers to some fun questions. Kevin Hart and Ed Helms Surprise Fans (2:07) – The actors sit down with fans. Lunch Lady PSA with Kristen Schaal (1:02) – Schaal honors the lunch ladies. Sock Puppets Real Stars (:28) – George and Harold as sock puppets. The World of Dreamworks Animation – Shrek, Madagascar, How to Train Your Dragon, Kung Fu Panda, The Croods, Turbo and Home. Sneak Peek – The Boss Baby, Diary of a Wimpy Kid: The Long Haul, Voltron: Legendary Defender, Despicable Me 3 and The Nut Job 2: Nutty By Nature. 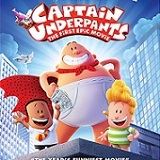 Captain Underpants: The First Epic Movie certainly isn’t for everyone but the elementary school crowd is bound to find it hilarious. The voice actors do a wonderful job bring the characters to life with a lot of heart. Adults will probably be less interested in the extras but let’s face it this release isn’t for you. Still, everyone can love the sight of an overweight man in his tighty-whiteys.